Please bring a valid photo ID with you. Once on the airplane, no refunds or transfers are available. * Until 72 hours before your scheduled jump. ** Transferable amount varies by situation; call our office at 281-369-3337 for details. *** Video and photo quality are not guaranteed. **** Gift certificates’ cash value never expires. Gifts sold at a promotional discount are worth the promotional value until their expiration date; after that they are worth the cash value paid. 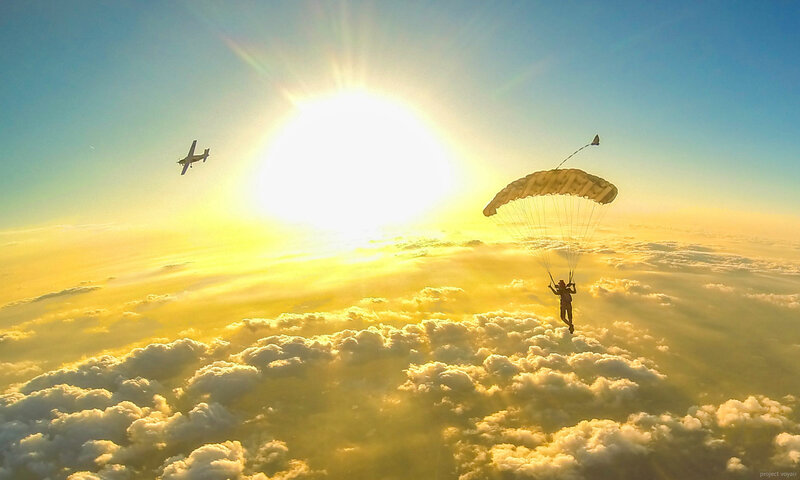 All products, new or used, are sold “AS IS” and “WITH ALL FAULTS.” Skydive Spaceland Gear Store specifically disclaims the implied warranties of merchantability and fitness for a particular purpose. Privacy/Security: We don’t sell, rent, give, or loan your information to anyone. Personal information needed to complete your order is stored by Skydive Spaceland, but your payment information is stored only by our payment processor Authorize.net. Access to personal information is highly limited to those who handle order processing/fulfillment and/or customer service requests. Your trust and business are of paramount importance to us! Returns: We will accept the return of any unopened/undamaged products. Returned products must be accompanied by original receipt/invoice and description of what is being returned and statement of refund request. Refund amount is based on the condition of the product being returned and does not include shipping/handling fees. Custom products, opened or used products: We do not issue refunds for these products. At our sole discretion, the Skydive Spaceland Pro Shop may choose to help sell the product at a discounted rate and issue a partial refund once the used product has sold. Exchanges: We can exchange products due to incorrect fit/size, such as helmets or clothing. Product must be returned with original receipt/invoice and statement on the size needed. Returned product/s must be in new condition. All original parts/accessories must be in returned in original packaging. Customer will only be charged shipping/handling as long as the exchange does not affect the price. We accept Visa, MasterCard, American Express, and Discover credit cards, as well as direct bank draft when purchasing online. Prices listed on SkydiveSpaceland.com are the same in the store, plus shipping/handling and state sales tax if applicable. Prices are subject to change without notice, and we will do our best to communicate price change before shipment. Overstock/out of season discounts will be available on some products at varying times. We may eventually offer large volume sales in the future. Sale prices will be reflected at SkydiveSpaceland.com. Manufacturer warranties apply to any defective products received from SkydiveSpaceland. Most warranties/defects are handled directly through the manufacturer. Skydive Spaceland will assist in service issues with the manufacturer in most cases. At our sole discretion, we will directly replace the defective product and handle the return/exchange with the manufacturer. If you have purchased a product from us that is defective, please contact us at 281-369-3337 or proshop@skydivespaceland.com and we will determine the best course of action for your situation. The most efficient purchasing method is our online store (https://houston.skydivespaceland.com/shop/ ). We will also accept orders via phone and email to proshop@skydivespaceland.com. Emails will be addressed in the order in which they are received. Expect a response within 48 hours. Online orders are processed on weekdays. If you order items on Saturday or Sunday, shipment will occur Monday. Phone orders will be processed Monday-Friday 8:00 AM – 5:00 PM. Please call us at 281-369-3337 and ask for the Pro Shop. If leaving a voice mail, leave a detailed message with your name, number, and specify pro shop order and we will return your call as soon as possible. Custom/ out of stock/ special order products are noted as such on the product pages and typical production and delivery lead times are specified there. In-stock items will ship within one business day. Custom or out-of-stock orders will be shipped within one business day of receipt from manufacturer. Customer will be notified about out-of- stock products either by product page pop-up message or by customer service representative within one day. We will also communicate the estimated lead time for custom/out-of-stock orders. Our preferred shipping method is UPS, but you may also elect to pick up your item at Skydive Spaceland. All orders include a $3.00 handling charge, not including shipping or tax. Shipping does not include tax.